The Zombie genre has received a huge mainstream resurgence after 28 Days Later (which was actually not intended as a Zombie flick). This resurgence is not necessarily a good thing - seeing as it leads to remakes like these. Unlike the case of the Texas Chainsaw Massacre remake recently, this one is an unforgivable drag. I don't mean the pace - there's a lot of action, blood, gore, cool FX and cheap scares. The only similarity is the shopping mall our survivors hole up in and the black male protagonist (Ving). 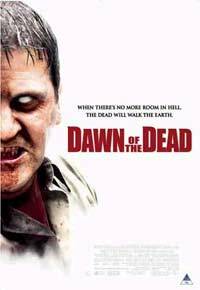 The original George A. Romero classic had a mood and atmosphere this film doesn't even attempt to replicate. The name sounds cool and the location is handy. For viewers unaware of the original there may be some thrills and screams. The filmmakers seemed to have borrowed more from 28 Days Later - from the zombie sounds to their speed, in stead of the lethargic staggering, moaning threat of the classic ones who may be slow, but come in a mass. At least original Dawn- & Day Of The Dead make-up man Tom Savini pops in for a cameo (he also had a role as a bike gangster in the original and in Rodriguez & Tarantino's From Dusk Till Dawn - probably being the actor who's appeared in the most films with Dawn in the title). I found the end credit sequence of handycam footage far more enjoyable than this movie itself!